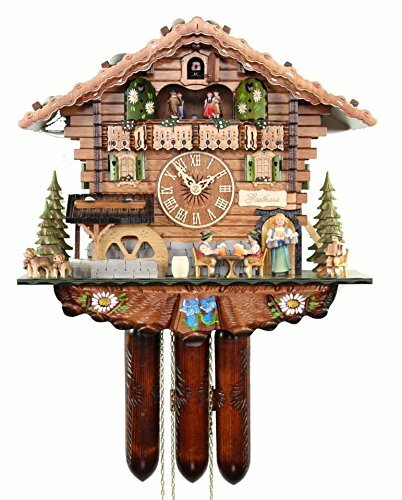 The chalet cuckoo clocks style is recognized for its finely carved parts and usually connected with animated characters, such as woodchoppers chopping, beer steins raising, mill wheels spinning and couples dancing in traditional Black Forest outfit. 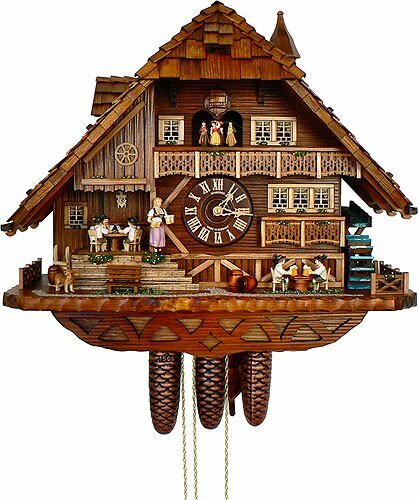 The chalet cuckoo clocks are similar to the traditional German cuckoo clocks, besides they additionally include carved woodchoppers. The chalet cuckoo clocks have extra parts as well as a roof or house that is made in a special chalet style. Chalet Cuckoo Clocks depict themes common in the Black Forest region of Germany and the Alpine farming lifestyles of Schwarzwald. 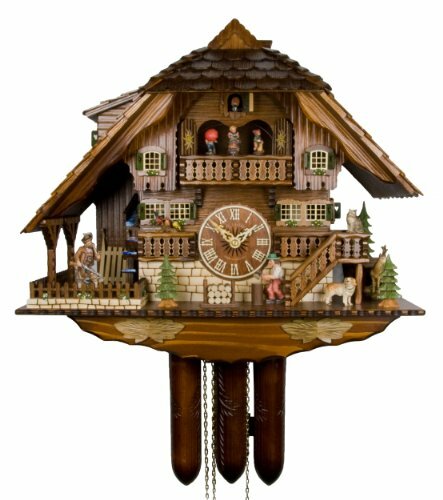 German cuckoo clocks have become a cultural icon and the chalet style clocks were popular for their human inspired designs, including figurines, music, and animations. It is important to note that even the Swiss-style chalet cuckoo clocks are hand carved in and originated from the Black Forest of Germany. Bavarian Chalet Clocks – Motivated with a special Bavarian lifestyle highlighting beer garden scenes and beer drinkers. Black Forest Chalet Clocks – Usually seen with an overhanging roof and concentrates on aspects generally recognized in German lifestyles and social gatherings. Swiss Alpine Chalet Clocks – Those are normally seen with a sheer house that would be standard in the Swiss Alps to support the massive snowfall. Each cuckoo clocks are unique and gorgeous, and the chalet clocks just add life with animation and music. From the maidens to the beer drinkers, the cows to the chickens, chalet cuckoo have something of recreation and wonder in each inch of their invention. If you are seeking for something to add to your place that has interest and style, then a beautiful chalet cuckoo is something that may very well interest you. Certificate of authenticity by the black forest clock association is included. The Hekas clock can be silenced manually with a lever. Happy Wanderer and Edelweiss – The melodies change every hour between the Happy Wanderer and Edelweiss. Movement: Regula – The clock has a mechanical REGULA movement from the market leader SBS-FEINTECHNIK in the Black Forest/Germany. Night shut off: Manually – The Hekas cuckoo clock can be silenced manually with a lever. The melodies change every hour between drink, drink, drink little brother and in Munich stands a Hofbräuhaus. A typical Black Forest Happy Family House. The Collectible figurines on the balcony. Movement: Regula – The cuckoo clock has a mechanical REGULA movement. Tunes: Happy Wanderer and Edelweiss. Moving beer drinker with dog and squirrel. woodchopper chops – plays 12 different alternating tunes on the hour. Uses “C” batteries (not included). Cuckoo comes out – cuckoos the number of hours on the hour. Dimension: 13″H x 12.25″W x 8″D. A switch enables you to choose either chimes or to cuckoo the number of hours on the hour. Battery-operated movement uses two “AA” battery (not included). 1 year guarantee. Made in Germany.